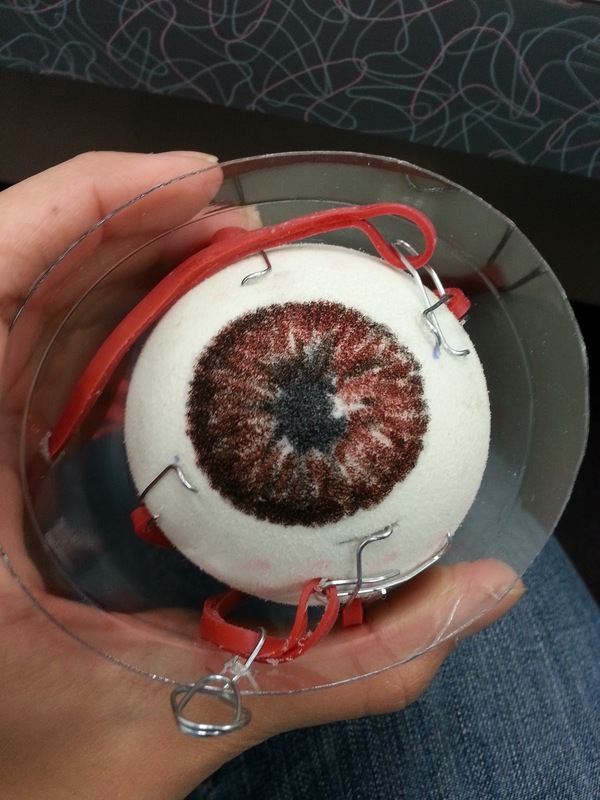 discordia: DIY Foam Eyeball: Science Project or Creepy Halloween Prop? 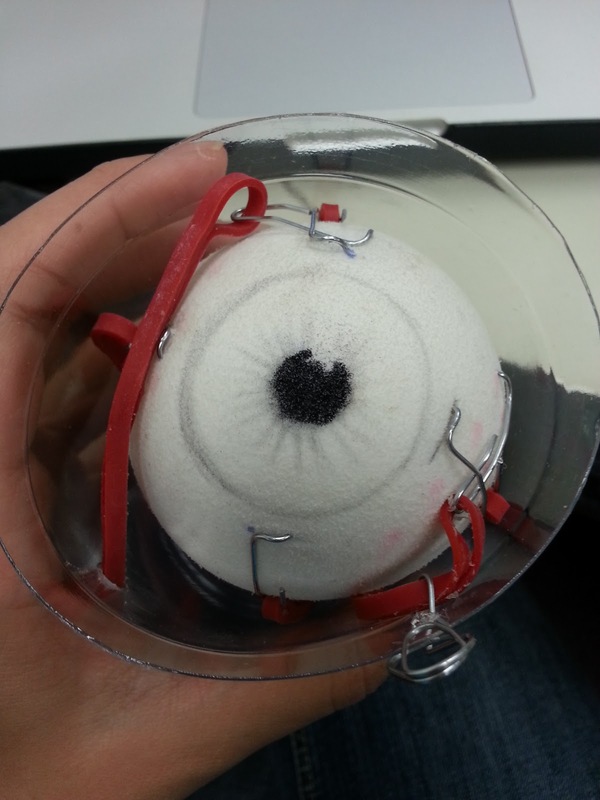 They eye I am working on is more the size of a small baseball, and thankfully made out of foam. 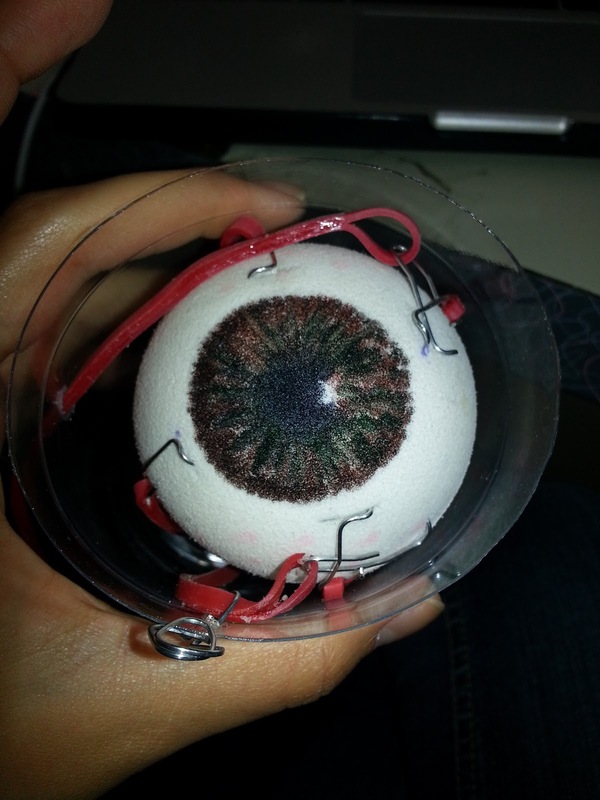 But my job this weekend was to make it look realistic, because when I got it, it didn't really look like an eye. This was a great assignment, because I kind of have a thing for eyes, or at least drawing them realistically. When I was a budding artist in high school, one of my teachers gave me a couple of tips to make eyes look really good in drawings and paintings, and they are techniques I have worked on over the years. 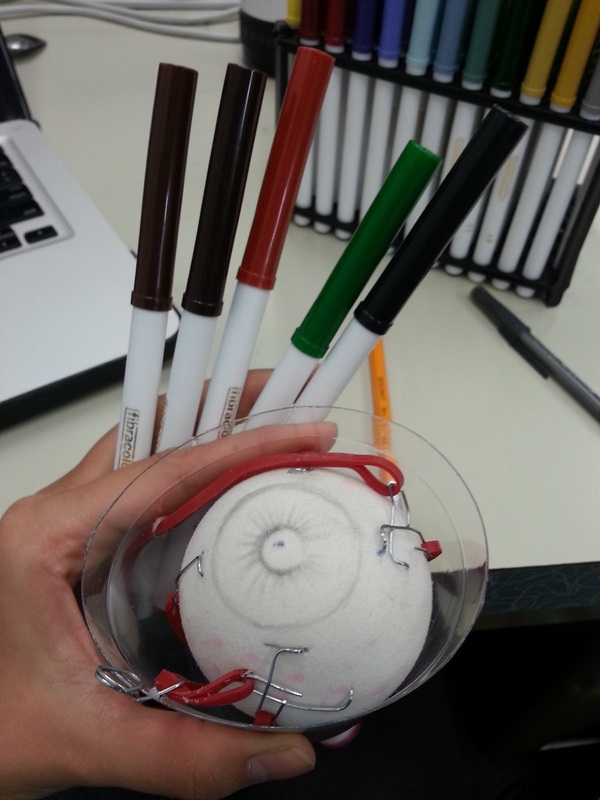 I used to doodle eyeballs in class all the time, which from a certain perspective might seem... ahem, weird. But really, it's pretty cool. 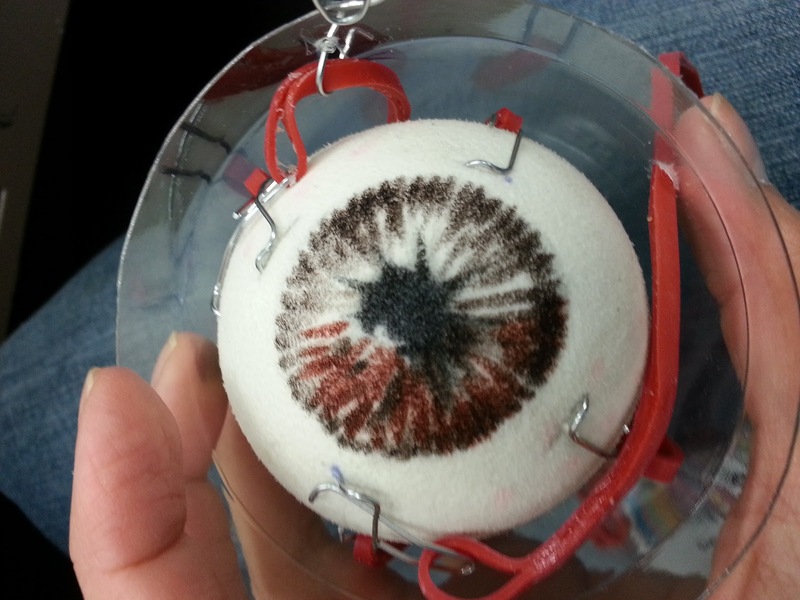 Since it's nearly Halloween, I thought a quick tutorial on how to make an eerie realistic eyeball might be handy for more than just the random science museum project. To start, grab your foam ball. 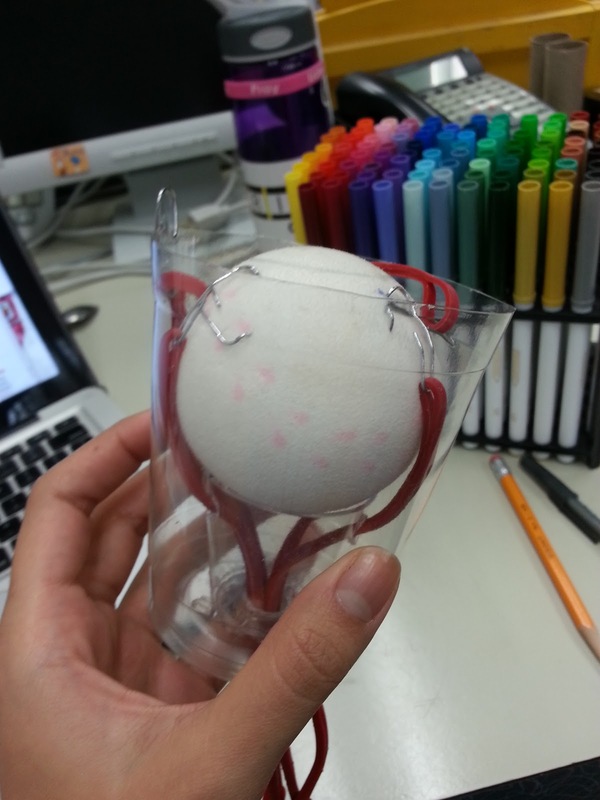 If you can't find a soft foam ball like I have, you can get a styrofoam ball. You will need to prepare the styrofoam a little with some white Crayola Model Magic (super easy to find at any toy or craft store, usually in the kids' section) or something similar. Model Magic is so great; it's neat and versatile, as an art teacher, I love this stuff like crazy. 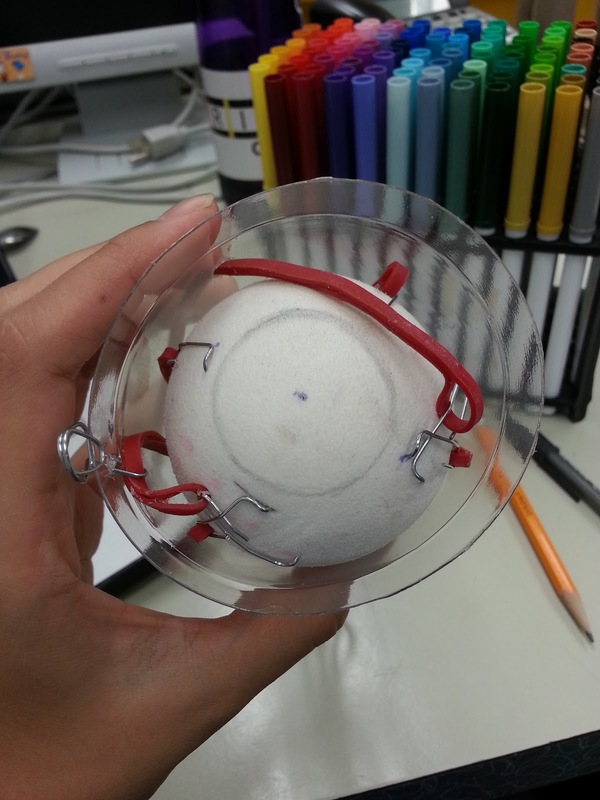 Flatten out the Model Magic into a disc and cover the styrofoam with it, smoothing out any bumps to make a smooth ball. 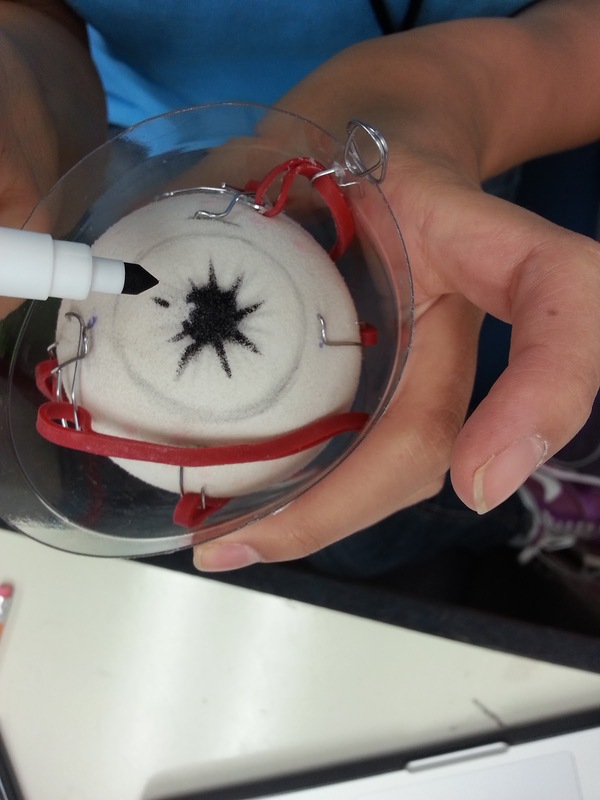 Allow this to dry, preferably overnight so that you can easily draw on the ball to make it into an eyeball. When you're ready to draw your iris and pupil, start by marking out how big you want the iris to be with the pencil. Draw lightly in case you make a mistake. 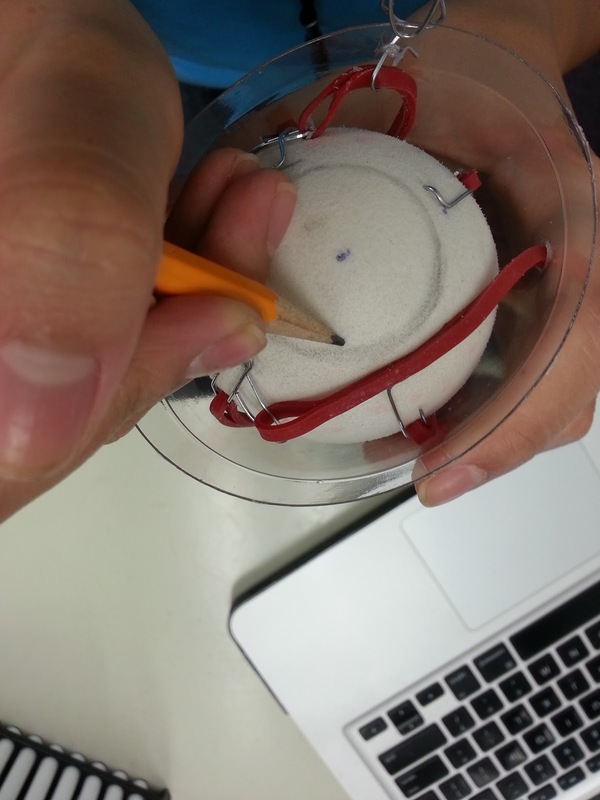 Try to make the iris as perfectly circular as possible. 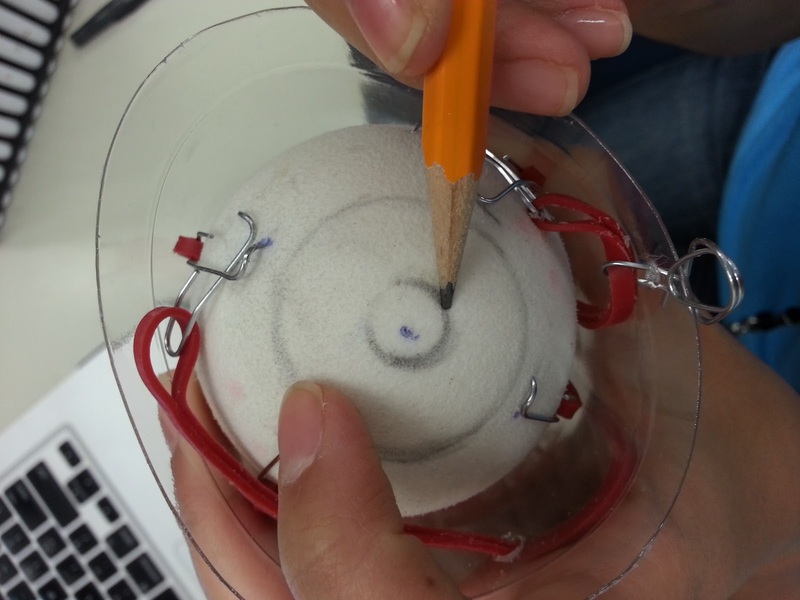 Now, sketch out a small circle in the middle of the iris circle for the pupil. Make sure you still use the pencil with light marks. When you're satisfied with that, you can start adding some extra details in pencil like the spokes of the iris. It helps to know a little bit of anatomy when it comes to drawing realistic body parts in art. The pupil is the part of the eye that lets light in, and that light is interpreted into images by your brain. 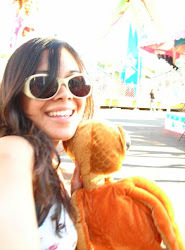 The pupil lets in different amounts of light depending on how much light is available. When there is not a lot of light available, the pupil expands to let in more light to get as much information as possible. When the eye is looking at something that has a lot of light, the pupil contracts to let in a little bit of light to protect the retina in the eye. You can see this effect if you look into a mirror while you dim and brighten the light around you. When the pupil expands and contracts, it is the iris that is changing shape. 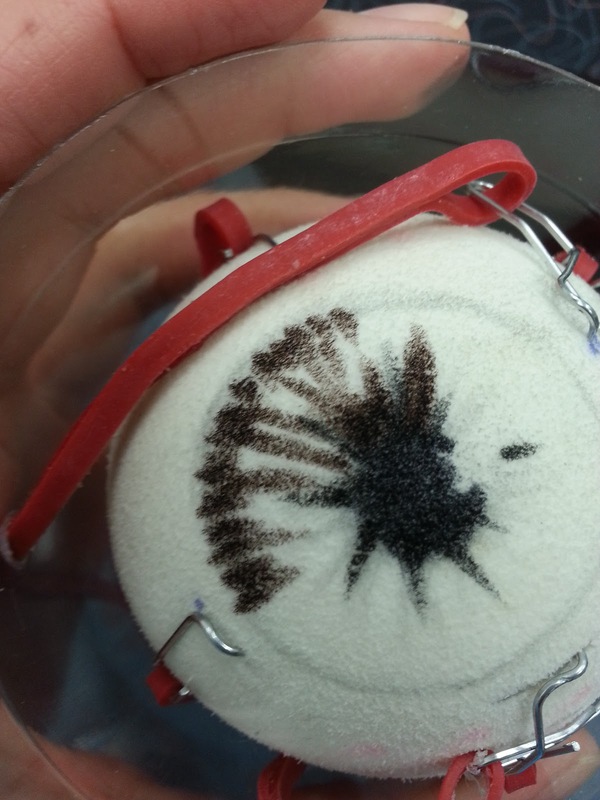 The iris is the colored part of your eye and it has small colored spokes (really, it does, check it out!). So when you are drawing a realistic eye, it's a good idea to keep these tidbits in mind. I always start the details of my eyes with the iris spokes around the pupil. They flare out from the pupil like the spokes on a bike wheel. I always sketch this out first with the pencil, just in case I do something that looks too weird. Next, I begin adding the color, starting with the darkest colors and working up to the lightest. My art teacher always said that in portraits, the darkest parts of a person's face are usually the nostrils and the pupil, so I start by making the pupil a super dark black. I leave a little bit of white at the corner to give the eye just a little sparkle, which makes it look more lively (as instructed by my HS art teacher). Then I begin coloring in the spokes, again, starting with the darkest colors and working into the lighter colors. I always color in the eye with straight lines coming directly from the pupil, to preserve the spoke-ness of the iris. I also vary the color patterns so that the eye doesn't look like one big blob of color. Eyes have some amazing detail in them, which is the secret to making them look realistic. I add accent colors like gold and green at the very end so that they can stand out really well around the main colors. To finish off, I touch up the pupil to make sure it's still extra dark. And that's it! 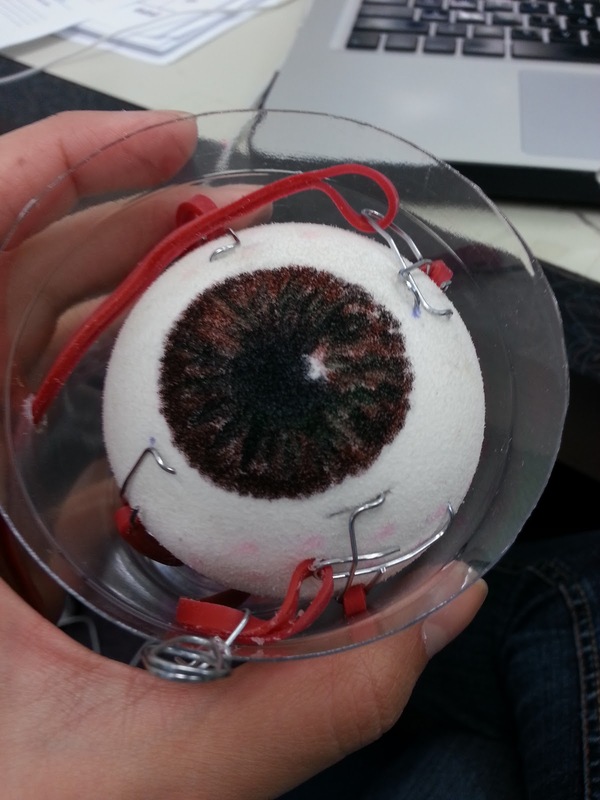 Now I have a creepy eyeball on my desk at the museum, soon to be used in a really cool top secret educational thing I'll tell you about later!